Let’s celebrate and have fun at JCCC New Year’s Festival, which kicks off with an exciting performance of Taiko Drumming. 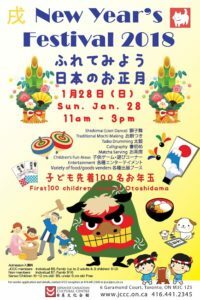 You can also enjoy the Japanese traditional lion dance, Shrine display, calligraphy, Matcha tea serving, a lot of delicious foods, entertainments and lots more. There will be a demonstration of Mochi Making (mochitsuki) where participants are encouraged to take part! In the Children’s play area traditional new year’s games and plays are available to both enjoy and participate in. 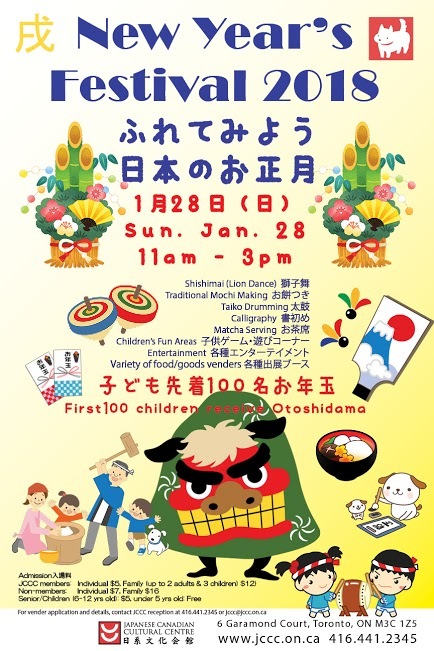 The first100 children visitors can receive Otoshidama near Admission area.